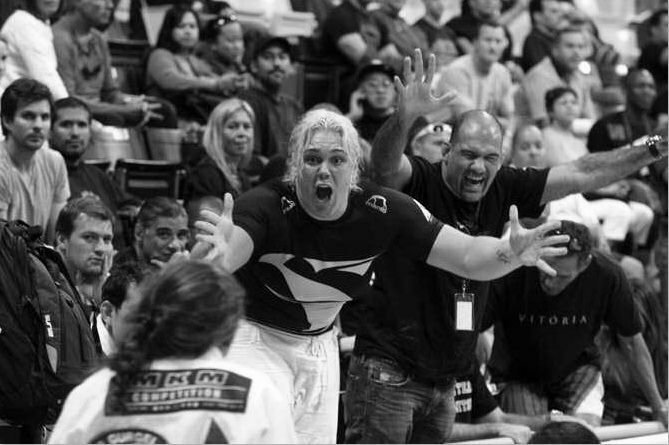 DSTRYRsg: Destroyer Submission Grappling and Brazilian Jiu Jitsu: RUNDOWN ON 2010 WORLDS BLACK BELT FINALS. RUNDOWN ON 2010 WORLDS BLACK BELT FINALS. The Worlds Finals is pretty much "must see" stuff for any card carrying grappler. No excuses. If you missed it, I pity you and am coming over to repossess your gis (size A2 and preferably Gameness or SYR). Seriously. With the convenience of watching this event stream live, there's no excuse for not watching. Plus, you must support our sport and it's elite athletes. Rooster/Light Feather/Feather. Super technical, but not too exciting. Malfacine vs. Terra and Mendes vs. Cobrinha were both drawn-out chess matches. Silva and Braga closed out Light Feather. What happened to Guillherme Mendes? Lightweight. I had JT Torres and Lucas Lepri making it further. Who knew Alves would make it to the final? Close match. Langhi still top dog at Lightweight. Middle. Marcelo dominated until the semis. It was great to see him battle Kayron Gracie's guard (which he eventually passed). The final was close - Calasans is no joke. Middle Heavy. My favorite. Tarsis Humphreys is an animal. His victory over Romulo Barral was a sweet upset and he even got the submission. Romulo tapped late and inured his knee. He couldn't continue to Open Class Final. Super Heavy. Roger Gracie. Surgical. Ultra Heavy. Super impressed with Cacava's walkout and his small guy game (lots of inversion). The dude is intense (and enormous). He submitted Cyborg (Cyborg's semi-final match was awesome - he submitted Braga Neto, who was leading in points, with something like 5 seconds remaining). Women's Finals: I don't know enough to comment on the individual weight-classes, but the performances were excellent. Leticia Ribeiro, Bianca Barreto, Kyra Gracie, Hillary Williams and Michelle Nicolini were all amazingly technical and great to watch. And, I'm now officially a Gabrielle Garcia fan. At light feather Guilherme Mendes lost his first round match to Paulo Mello(Gracie Barra). Paulo won by refs decision(tied at 3 advantages a piece) because he had a super deep triangle early in the match. Maybe the name didn't ring a bell because usually he enters under the name Celso Vinicius(as opposed to Alves), but Celso is a multiple time world champion, so him making the finals isn't a huge upset. I ended up watching both days at home, and there was definitely some great action. I saw Bill Cooper beat Finfou in a frantically paced match that had Finfou get deducted an advantage and then a point for stalling - because he was struggling to catch his breath. Then I heard Cooper and Kayron fought perhaps the greatest match at the tournament - also at a high pace. Cooper = entertainment. Faria plays his half guard kind of like Glover. Very interesting seeing such a huge guy playing deep half like that. Yessir!!! What a great weekend! It was like being front row at your favorite rock concert. and then to talk to Marcelo, Xande, Rafael, Roger et al. after was epic!!! Kayron and Rogers matches were my favorites. Faria and Cavaca are two new favorites of mine. the cyborg/neto match was one of my favorites of the day too. that triangle in the last 15 seconds was epic! seeing these guys compete in real life was an amazing experience. Just curious why Gaby is a favorite of yours now? Hey, Georgette. 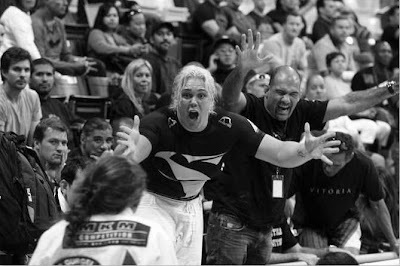 I thought she did what she needed to and killed it, but was being disrespected (Gracie Humaita, sitting right next to us, and other teams were making fun of her). Even so, she showed a lot of poise.